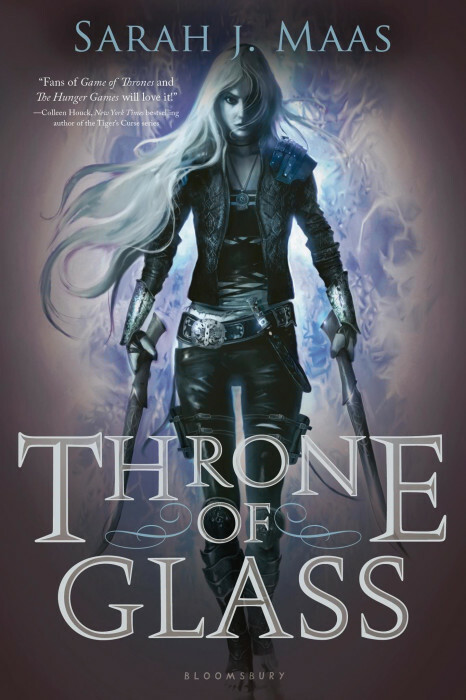 The first in a YA high fantasy series, Throne of Glass is the story of Adarlan’s Assassin, who has been captured and put to work in a slave camp. Where most die within weeks, Celaena has survived an entire year. When a troupe of soldiers led by the Prince come for her, she puts up a fight. But it soon becomes clear they aren’t there to kill her, and she becomes curious to discover her fate. The Crown Prince will provoke her. The Captain of the Guard will protect her. And a princess from a foreign land will become the one thing she never thought she’d have again: a friend. But something evil dwells in the castle-and it’s there to kill. When her competitors start dying, horribly, one by one, Celaena’s fight for freedom becomes a fight for survival, and a desperate quest to root out the source of the evil before it destroys her world. The premise is interesting: The King wants a new Champion, so a number of the members of court pick a candidate, and they compete in challenges and in direct fights. Many go with well-known warriors, thieves for hire, bounty hunters, and just vicious criminals. The Crown Prince selects the mysterious “Adarlan’s Assassin”—whom many don’t even know is an 18-year-old girl. I enjoyed Throne of Glass by Sarah J. Maas and I’m curious about where it’s going. My main problem was the characterization of Celaena seemed mixed; at times she is strong willed, level headed, and smart, and other times she is frivilous and lacklustre. As I think about it more, I wonder if this was an intentional decision—to depict her as both a ruthlessly trained killer as well as “just a girl”. One of the recurring problems I saw was that she is supposedly this widely renowned assassin, trained since she was a child, and yet frequently lets her guard down. There are a couple scenes where someone comes to visit her, or a maid enters the chambers, and she’s “sound asleep”. If I were the best assassin in the country, I would wake up at the drop of a pin and sleep with a knife under my pillow. The pacing of the plot was pretty perfect—Celaena (who is going by the name Lillian in the King’s Court to maintain her identity) was malnourished and in poor physical shape after the slave work camp. So for the first few weeks we get to see her regain her strength, rekindle her desire to live, and we rediscover her sharp wit and personality. I really liked that she was strong-willed and determined—she scowls, and rolls her eyes, and is at times obstinate. Sometimes she is a bit pouty, but I guess that gives her more of a three-dimensional characterization. It’s clear early on that both the Captain of the Guard, Chaol Westfall, as well as Prince Dorian, are developing feelings for her. Less clear is her feelings for the men, although she seems to like both of them for different reasons. As Chaol and Dorian are also best friends, I really liked the way the author navigated this love triangle. It didn’t seem overly wrought with drama, and actually felt quite believable. The world building was also really interesting and I appreciated not having info-dumps every few chapters. Information about the royal family, the empire’s expansion, the state of magic, and the current political conflicts are all conveyed gradually. What we needed to understand the current plot was presented to us, and sometimes more was hinted at. The only info-dumps that seemed to happen were overt description regarding characters—colour of hair, or the physique. I found these to be glaring hold-ups to the pacing of the plot. I prefer details like this to be given as needed; why would we need to know the style of their outfit now, unless it later matters, for example if it is unsuitable for a fight. Although the world building exposition was well done overall, it doesn’t take a very detailed reading to discern what is going to happen; the foreshadowing was fairly transparent. This isn’t a criticism so much as an observation. There was enough at stake and unanswered that I wanted to keep reading. Speaking of “unanswered”—the magic. So the kingdom is supposedly without magic, having inexplicably disappeared ten years prior. There is a lot of exposition that hints toward something bigger (hence why this is the first in a series of books), but there is also a good chunk of magic dealt with in Throne of Glass. Putting aside the empire’s political and military conflicts, the competition to become the King’s Champion is going sideways. Other contestants, particularly stronger ones, are being brutally murdered, leaving their corpses mutilated in an unnatural manner. Although Celaena’s curiousity in the matter is not really justified (aside from not being killed herself) it is convenient that she starts investigating the murders. And, without going into too much detail, I think that this really begins to set the stage for the future books. So while I wasn’t blown away, I am definitely curious to see how the story unravels. Throne of Glass was published in 2012 and the sequel is called Crown of Midnight.